We work closely with the Ophthalmology and Neurosurgery departments to provide care to those patients with disorders that either affect or are accessed through the nose and paranasal sinuses. Additionally, we collaborate with the Allergy and Immunology Division and hold specialized combined clinics to streamline the care of patients with complex sinus issues and asthma. Our Nurse Practitioner, Tory Hoelscher, works closely with both Dr. Payne and Dr. Mattos in the care of our patients and also sees patients independently. 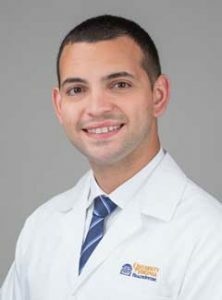 In the Nasal & Sinus Disorders clinic we specialize in caring for patients who have complex problems and who may have seen several other physicians or had prior surgery. It is important to make sure that we will have access to prior office notes, operative reports, and digital images from previous CT scans or MRIs from both before and after any surgeries. Often times our scheduling department will arrange for this before your visit, but it is very helpful to check to see if this information has arrived and/or if you should bring some of these items along with you. After you have registered for your visit on the first floor of our office building, you will need to check in with our reception desk in Suite 2200. One of our nurses or medical assistants will bring you to an exam room and go over some of your basic health history and check your vital signs including weight, blood pressure and pulse. 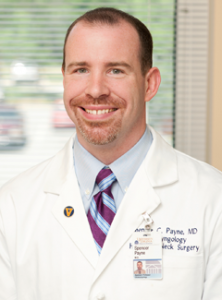 As UVA is a training institution, you may see one of our resident physicians before meeting Dr. Payne, Dr. Mattos or Ms. Hoelscher. They will be able to ask all the important questions and get the information that we will need to help us focus on solutions to your symptoms. Part of this evaluation is also likely to include what is called a nasal endoscopy during which we will use a special camera system to look deep inside your nose. This helps us figure out what might be going on and determine the best treatment options. Sometimes we recommend surgery after your first visit, but often we will talk about a variety of medical treatments such as nasal sprays, special allergy pills or medicated rinses for your nose that may help avoid surgery. Regardless of what we find, we are poised to offer you a wide range of options that are often very minimally invasive. After you have spoken with your provider, a member of our nursing staff will come in to talk with you and make sure you understand everything that was discussed. They will also review any special treatments that you will need to do before coming back to see us. Depending on what we think is going on, you may be asked to return anywhere from a few weeks to a few months later. While you wait for your next visit, we are happy to answer any questions regarding your care through UVA MyChart, a HIPAA compliant electronic messaging system that will put you in contact with our care team!